Some 15,000 Oklahoma teachers, support staff, students and public employees marched and rallied at the state capitol in Oklahoma City on Monday, the first day of a statewide strike by as many as 40,000 teachers in the southwestern US state. The walkout—the first in Oklahoma since a four-day strike in 1990—is part of a growing rebellion of educators across the United States in the aftermath of the nine-day strike by West Virginia teachers. The same day teachers were striking and protesting in Oklahoma, thousands of Kentucky teachers, including many who had taken part in wildcat sickouts, descended on the capitol in Frankfort to oppose the slashing of teacher pension benefits. Protests and demands for a statewide strike are also taking place in Arizona, where Republican Governor Douglas Ducey has rejected teacher demands for a 20 percent raise. On Monday, Ducey was booed loudly by the crowd after he was introduced at the opening day ceremony for the Cincinnati Reds baseball team. As in other states, the Oklahoma strike is driven by rank-and-file teachers, not the unions, which have accepted more than a decade of bipartisan funding cuts that have deeply eroded teachers’ living standards and classroom conditions. Although the Oklahoma Education Association (OEA) and the Oklahoma City American Federation of Teachers (AFT) had sought to block a strike, and then limit it to one day, the strike is continuing. As of this writing, at least two dozen school districts, including the four largest—Oklahoma City, Tulsa, Norman and Broken Arrow—have already announced they will be closed due to the teacher walkout at least through Tuesday, with many school boards deciding on a day-by-day basis whether or not to open schools. Educators in Oklahoma are among the lowest-paid in the United States. Many work extra jobs to pay off student loans and other living expenses. Teacher aides, cafeteria workers, school bus drivers and other paraprofessionals are even more poorly paid. Teachers are not only fighting for completely justifiable pay raises, but to reverse more than a decade of relentless budget cutting by Democrats and Republicans that have undercut public education for the state’s 700,000 students. Oklahoma is currently 48th in per pupil spending, with 20 percent of the school districts cutting back to a four-day schedule. Teachers and students constantly complain of shortages of textbooks and other supplies, overcrowded classrooms and deteriorating buildings. Like teachers around the country, Oklahoma educators spend a good portion of their meager paychecks helping students pay for lunches, field trips and supplies. A decade of permanent austerity measures carried out by Republican Governor Mary Fallin and her Democratic predecessor, Brad Henry, coincided with huge tax cuts to the oil and gas industry, which dominate the state’s economy. Underscoring the real relationship of the state legislature to big business, the capitol building actually sits on top of the Oklahoma City Oil Field. Less than one hundred yards from the building are operating oilrigs with the names of Phillips 66 and other oil companies. Thousands of teachers and their supporters formed a picket line around the capitol building, carrying homemade signs demanding that the state legislature fund public education. They denounced last week’s pay raise and funding bill, passed by the state legislature and signed by Fallin, which provides a one-time average wage increase of $6,000, funded primarily by regressive taxes on gasoline and diesel fuel, cigarettes and gaming. 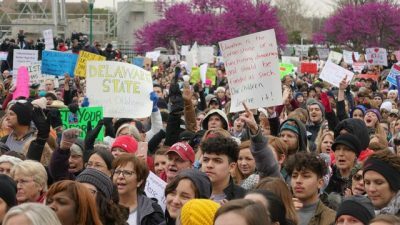 The strong turnout of students was indicative of the popular support for striking educators, despite efforts by the media to slander teachers as “selfish” and indifferent to the plight of their students. One student carried a sign saying, “You can’t support students without supporting teachers.” A separate tent was set up for students to voice opposition to the budget cuts and support for their striking teachers. While a few teachers and students spoke from the official platform, it was dominated by highly paid union executives with a long record of betraying teachers. This included the National Education Association President Lily Garcia (salary $348,732) and American Federation of Teachers President Randi Weingarten ($492,563), along with Dale Lee, the president of the West Virginia Education Association (WVEA) and Alicia Priest (image on the right), president of the Oklahoma Education Association (OEA). Well aware that they could not simply shut down the strike, the union officials postured as champions of the struggle, which they had desperately sought to prevent from the start. They repeated the claim that the legislature had passed a “historic” pay raise and funding bill and only needed to be convinced to “do their job” to fully fund education. Determined to prevent the Oklahoma strike from becoming the catalyst for a broader, national strike by teachers, the unions are seeking to wear down strikers by engaging them in fruitless lobbying directed at corporate-bribed politicians, while working with state Democrats to offer some kind of meaningless gesture to help wrap up the strike. The union functionaries promoted the lie that electing Democrats in the fall would reverse decades of budget-cutting, even though Democrats at every level of the government, including President Obama, have spearheaded the assault on teachers and public education. She praised last week’s revenue proposal, saying it represented the “largest investment in public education in state history,” but complained that the state Senate had removed the hotel-motel tax, leaving a $50 million funding hole. “They must close the gap,” she said, advocating the restoration of yet another regressive tax. Priest went on to acknowledge that this “historic” proposal would do nothing to address the 11 years of continuous funding cuts and would amount to no more than the cost of a textbook for each student. She concluded by saying that teachers were “better organized because of your activism,” failing to note that teachers’ activism had erupted in opposition to the unions.